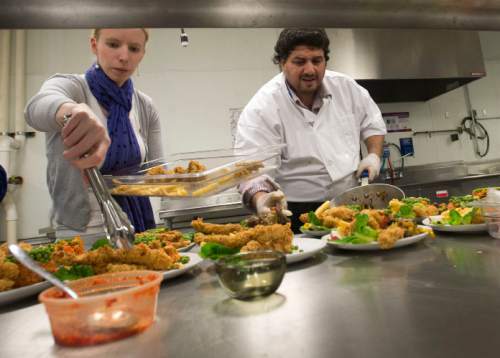 Utah refugee kitchen helps Syrian chef shine light on his native cuisine. Steve Griffin | The Salt Lake Tribune Nour Eddin Abdul Bari, a Syrian refugee, who was a chef in Damascus, prepares a meal for a focus group as part of the Spice Kitchen Incubator in Salt Lake City on Wednesday, Jan. 20, 2016. 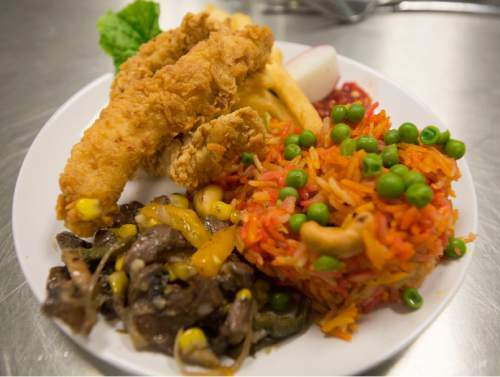 Pictured, his East-meets-West entree, with marinated beef, basmati rice, rice french fries and chicken strips Steve Griffin | The Salt Lake Tribune Nour Eddin Abdul Bari, a Syrian refugee, who was a chef in Damascus, prepares a meal for a focus group as part of the Spice Kitchen Incubator in Salt Lake City on Wednesday, Jan. 20, 2016. Abdul Bariís four-course meal started with fatoosh, a Syrian salad with lettuce, cucumbers and tomatoes. Steve Griffin | The Salt Lake Tribune Nour Eddin Abdul Bari, a Syrian refugee, who was a chef in Damascus, prepares a meal for a focus group as part of the Spice Kitchen Incubator in Salt Lake City on Wednesday, Jan. 20, 2016. He is getting help from the Spice Kitchen Incubator and plans on opening his own establishment in the Salt Lake Valley. Steve Griffin | The Salt Lake Tribune Nour Eddin Abdul Bari, a Syrian refugee, who was a chef in Damascus, prepares a meal for a focus group as part of the Spice Kitchen Incubator in Salt Lake City on Wednesday, Jan. 20, 2016. 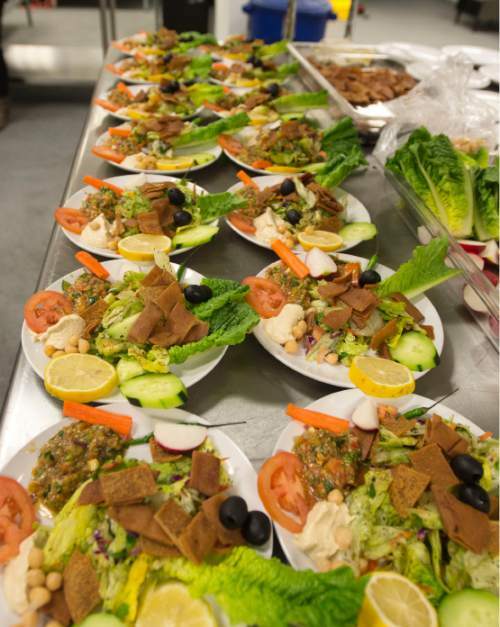 Abdul Bari's four-course meal started with fatoosh, a Syrian salad with lettuce, cucumbers and tomatoes. Steve Griffin | The Salt Lake Tribune Nour Eddin Abdul Bari, a Syrian refugee, who was a chef in Damascus, prepares a meal for a focus group as part of the Spice Kitchen Incubator in Salt Lake City on Wednesday, Jan. 20, 2016. He is getting help from the Spice Kitchen Incubator and plans on opening his own establishment in the Salt Lake Valley. Steve Griffin | The Salt Lake Tribune Nour Eddin Abdul Bari, a Syrian refugee, who was a chef in Damascus, prepares a meal for a focus group as part of the Spice Kitchen Incubator in Salt Lake City on Wednesday, Jan. 20, 2016. He is getting help from the Spice Kitchen Incubator and plans on opening his own establishment in the Salt Lake Valley. Steve Griffin | The Salt Lake Tribune Nour Eddin Abdul Bari, a Syrian refugee, who was a chef in Damascus, prepares a meal for a focus group as part of the Spice Kitchen Incubator in Salt Lake City on Wednesday, Jan. 20, 2016. He is getting help from the Spice Kitchen Incubator and plans on opening his own establishment in the Salt Lake Valley. Nour Eddin Abdul Bari stands before members of a tasting panel and explains how the overflowing plate before them is his interpretation of East-meets-West. It is a description of the 40-year-old refugee&apos;s new life in Salt Lake City as much as it is of the food he has prepared. From the East  where the Syrian-born Abdul Bari has spent most of his life  comes a colorful mound of basmati rice mixed with onions, peppers and mushrooms. Next to it are tender strips of marinated beef, "much like fajitas," he says of the dish, which is combined with kernels of yellow corn and sautéed onions. From the West  where Abdul Bari has lived for less than a year with his wife, Rzan, and their five children  he provides classic french fries and chicken strips. The latter have a crisp, golden coating and tender white meat. No American fast-food outlet ever served nuggets this delicious, the tasters agree. With flying colors, Abdul Bari has proven he can produce restaurant-quality food, a major step as he moves through the Spice Kitchen Incubator, a 3-year-old program of Salt Lake County Refugee Services and the International Rescue Committee. Spice education • Two times a year, about eight to 10 new refugees and immigrants, some who speak little or no English, are accepted into the Spice Kitchen program where they are provided education and resources to build a viable food business. Food is one of the easiest commodities to turn into a business as people assimilate into a new country, said Grace Henley, the program director with the IRC. But it is also one of the most difficult to find success. That is where the Spice Kitchen Incubator can help. The program is divided into two parts, she said. During the first six months, or "pre-incubation" period, participants learn the basics, from developing recipes and learning how to analyze food costs to understanding state and federal laws surrounding food handling. When the participants have nearly completed this phase, a tasting panel is assembled. Made up of Spice Kitchen volunteers and food industry professionals, the panel gives feedback on the food, how it is presented and what could be done to make it more enticing to American palates. The refugees then move into the business "incubation" phase, where they launch their business, with assistance from Spice Kitchen employees. Henley said over the past three years, about 45 people have entered the Spice Kitchen program; 14 are operating businesses and 15 are in the pre-incubation stage; the rest started, but left the program before finishing. Suha Al Abadi and her sister Mayada Saihood launched Olives & Thyme catering six months ago. Serving falafel sandwiches, hummus and other Middle Eastern foods from their native Iraq, they said, wouldn&apos;t have been possible without the help from the Spice Kitchen program. "We have to work here in America, and cooking is the easiest thing for us to do," said Suha Al Abadi. "But we didn&apos;t know how to begin or know the rules." Henley said in most cases, refugees are discouraged from opening a restaurant because of the large initial investment or loan requirement. 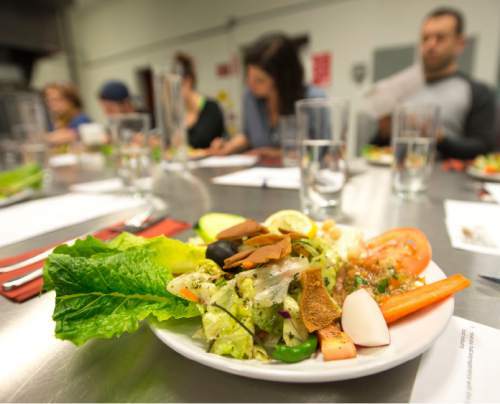 Most take on a less-risky food business, such as catering, selling at a farmers market or producing packaged products, food businesses where they can use the incubator&apos;s 1-year-old commercial kitchen at 2180 S. 300 West, for a subsidized fee. Light of Damascus • Abdul Bari may be the exception. 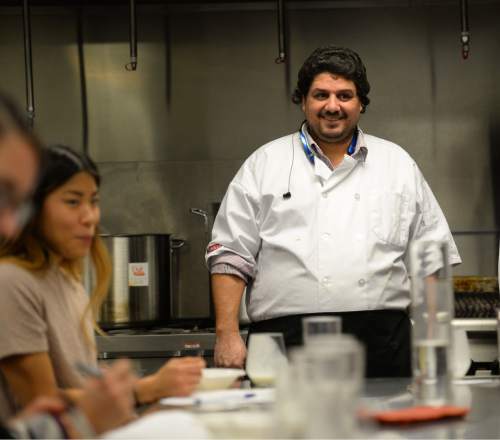 Having worked as a chef in Damascus before leaving Syria in 2011  about six months after civil war erupted  he has moved through the pre-incubation program quicker than most and is well prepared to open a restaurant, Henley said. He spent four years in Libya and Egypt before settling in Utah. 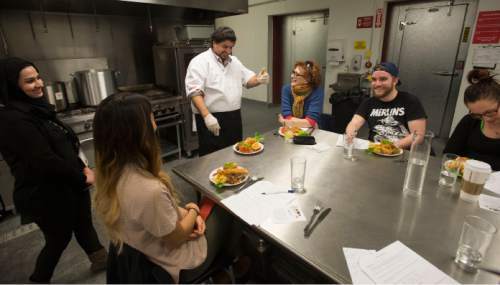 Through the program, Abdul Bari, who also works at a Salt Lake City Middle Eastern restaurant, has learned the U.S. restaurant business in a year, something that probably would have taken him four or five years on his own, he said through an interpreter after the tasting. "You can tell he is ready to start his own business," said panelist Kate Lundy, a member of the local Slow Food. "And Salt Lake will be lucky to have it." Lundy, like several other tasters, was impressed with Abdul Bari&apos;s four-course meal that started with fatoosh, a Syrian salad with lettuce, cucumbers and tomatoes. It was served along with bright-tasting baba ghanoush (eggplant with onions, tomatoes and spices), creamy hummus and crisp vegetables. Then came a bowl of chicken noodle soup with a touch of curry and the East-meets-West main course. Following a yogurt drink "to aid digestion," panelists were served eshai sherian, a homey Syrian version of bread pudding made with sweetened milk and a dry biscuit, topped with pistachios, pine nuts and coconut. With his tasting panel complete, Abdul Bari will soon apply for a business license and look to lease a small space for his restaurant, which he plans to call Noor Al Sham  or Light of Damascus. His specialty will be Syrian shawarma, the cone-shaped meat and seasonings that are slow roasted on vertical spits and then sliced for sandwiches. The Syrian version differs from other Middle Eastern offerings because of the "mixture of spices," Abdul Bari said. His unique blend contains 22 flavors, including cardamom, lemon, orange and vinegar. When his restaurant opens, diners also can expect another of Abdul Bari&apos;s specialties  rice. He has "32 different recipes" in his arsenal. Abdul Bari and his family are among a handful of Syrian refugees who have settled in Utah, but that number is expected to rise, which should help his business. He hopes locals will visit as well. Whether it is served at a wedding or for a birth, every Syrian dish "has its own story," he said. That is what he believes makes his country&apos;s cuisine special: "Memories." GenR  short for Generation Rescue, the young professionals of the International Rescue Committee  will host a fundraiser to benefit the resettled refugees in Salt Lake City. The event includes music, networking, prizes and food prepared by refugees participating in the IRC&apos;s Spice Kitchen Incubator. When • Tuesday, Feb. 23, 6 to 9 p.m. Cost • $50 before Friday, Jan. 29; $65 after; members, $45; VIP tickets, $75.